The Jabra BT-3030 is an impressive device. What some folks may look at as drawbacks I actually think are strengths. First of all, the complaints I occasionally read about the wired earphones you need to plug in are laughable. The primary reason why the 3030 is a good choice is for MUSIC. How are you going to get a good bluetooth wireless listening experience if the fidelity of the earphones/buds you use are poor, which the vast majority of them out there definitely are? Instead, the great thing about the 3030 is that you can plug in any 3.5" earphones you like (besides the included one, of course) and so it will sound pretty close to ideal depending on what you choose. I say pretty close, because there is some fall-off in the high-end range of the sound. But trading off for the convenience, it's more than acceptable. And this is wireless audio, so I can't really expect perfect fidelity. The dog-tag design may not be to others' tastes but I think it's "3C" - cool, clever and compact. It controls my phone's player functions well. -it doesn't get along well with my Samsung WEP200 Bluetooth Wireless Headset (Black). Other folks report standalone headsets with better relations - my WEP200 must be turned on first to work at all with my phone, and then won't allow the player controls on the 3030 to work anymore. Luckily, this is only during car rides anyway (I just don't want to use my car stereo as a speakerphone through the 3030's feed) so not a deal-breaker. -I also found out that it cannot charge and operate simultaneously. A bummer for long car trips especially, but 6-7 hours on a charge mitigates that somewhat. I tried using this with a WiREVO A100 bluetooth transmitter for iPod. I'd previously used some Motorola headsets that worked fine, but wanted to use this with earbuds instead of headsets. Unfortunately, after connecting the BT3030 to the A100, I could not hear my music. I could use the pause/play/ff/rw buttons to control my iPod, however whenever I pressed the play button, I'd hear a second or two of garbled noise, then would only hear static. If I then paused it, then pressed play again, I'd hear another second of garbled noise, then static. I tested with the A100 connected to an iPhone, iPod Video, and an iPod Nano. On all three devices, the A100 could stream to my Motorola HT820s, but would not work with the BT3030. I then tried connecting the BT3030 to my Macbook Pro. It connected fine, however the audio quality of the audio being streamed sounded equivalent to listening to 64 Kbps-encoded MP3s. i.e. very low quality. Tweaking settings didn't make any improvement. Attaching my HT820s to my Macbook Pro, the audio quality was fine. It is a little different in the style and design but I think thats a feature. I am not sure what the other reviewer was saying about its compatibility but I had no problems connecting with my Macbook Pro and my HTC Touch Pro. My favorite feature is that I can use any set of headphones with the tag for the best sound isolation. I am a bit of an Audiophile so I love my Etymotic ER-4 and ER-6 and they work perfectly with this BT. I will say that the Jabra included headphones are not bad and are actually built well. They are also very convenient with the shortened cable so perfect for wearing and putting the BT at the right height. I use these for running (2 to 8 mile runs) and they are great! Even though I carefully read each review and noted the general positive tone of each, I still stepped into this purchase reluctantly. I mean, how could this goofy little thing provide a) the sound quality I was looking for b) the range and c) a price point that would not make me feel remorseful about the purchase? I received the BT-3030 5 days ago. It arrived nearly fully charged at my work. I use a RocketFish Bluetooth dongle there. Anyway, I really didn't have to read the instructions. I turned it on and waited for the solid blue light and I was nearly immediately asked for the pairing code from my workstation. Once paired, I plugged in the headphones (my own) and I was listening to music....just like that. I previously had the Moto S9s. Nice concept, but crappy range (really a pity, I would have loved to keep them). So, the acid test for me was how would the range hold up? With my headphones and BT-3030 I got up from my desk slowly. I stepped away inch by inch away from my workstation. I was expecting a signal drop anytime now. The S9s would have just shut off completely at about 5 feet and you'd have to power up and pair over and over again. Not so with the Jabra. I kept moving further and further away....10ft...20ft...30ft....around a corner and into the kitchen...now about 35 feet away! At the end of my final journey I was nearly 40 feet away, behind two walls! It only stared stuttering when I move to 45 feet. The nice thing is (unlike my experience with the S9s) it didn't shut down when the signal got weak. It just politely stopped receiving but kept the connection open. As I moved back into range, it picked up where it left off. No big deal. This is the kind of engineering I was looking for and I honestly I was surprised that Jabra pulled it off. As for the battery life, well, I haven't really done scientific tests on it yet. But let's just say that after the first charge, I was able to listen continuously for about 6 hours. It started to flash red after 6 hours of use, but I probably could have listened for another 1 hour or so until the charge was completely spent. It took about 2 hours to charge it up, just like they said it would. What about the sound quality? Well, that depends on your transmitter and headphones. As I stated, I used the RocketFish adapter (it's tiny!) and I honestly can't tell the difference between a wired and wireless connection. There is a super slight hiss that you can hear in quiet passages, but (this will sound odd) it's kind of soothing. I can accept this owing to the fact that it IS a wireless device. Stuff like this usually bothers me, but for some reason it doesn't bother me at all. The S9s had the slight hiss too and they sounded good, but this device is reliable (so far) and the S9 was not (again, I'm sorry they didn't work out, they were a cool concept). At home I have Zonet dongle (about 3 years old now). I can tell that the quality is not as good. But all of this tells me that the BT-3030 is capable of doing the job I expected it too. The headphones that come with the device are actually pretty nice. I'm not audiophile, but I do like nice sounding music. They had better bass-response than my regular phones. The BT-3030 would probably sound fantastic with a really good pair of phones, but for me, what I have works fine. I do like the ability to choose you own headphones as well. And having the microphone on the dog-tag is a great idea. 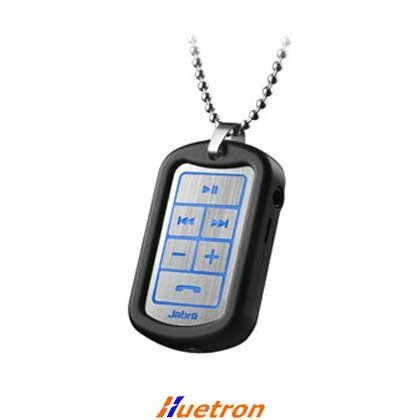 And speaking of the dog-tag, what a cool idea this is! I like the fact that the controls are easily within my reach and that it, well, kind of looks cool. When I was walking around at work people were wondering what it was. One guy thought it was some kind of heart monitor! But I really don't care what people think of it. I like it, it's light, it works. The fact that the controls are off your head is a major plus for me and I really like not being tethered to my PC/Phone. By the way, I tried pairing this to a Scosche IPOD adapter (forget the model, but it's the one that has the battery), and it would NOT pair at all. I blame the adapter, not the BT-3030. So, I'm returning the adapter. I've just purchased the Sony Bluetooth adapter and I hope it works with the BT-3030. I will then be able to work out without my iPod strapped to me. Another note, I paired this device with my Moto K1 phone. It worked perfectly. Got about 30 feet range, but the sound quality was fine and it was awesome being able to control the tracks on my cell phone and take calls as well. Finally let's talk about the price and presentation. Some think this item is pricey. At nearly 50 clams, I'd say it's is worth the price. I probably would not pay more than that though. In other words, for me it seems like a good value. The item itself came in a good looking package which enhances the buying experience. Some people may wonder why people even comment about packaging. It does seem odd; after all you're not using the box it came in. But it communicates to me what the company thinks about their product and the pride they have in presenting it to the public. Inside, everything is right there and ready to be used right away. I even appreciate the fact that it came with nearly a full-charge (unless I got someone's return!). I'd like to think Jabra did this as a convenience for the customer. It's reliable, works well and fairly priced. You have the flexibility to use just the right headset for yourself too. So far, I am very pleased. UPDATE: I have since purchased the Sony Bluetooth transmitter for the Ipod. The transmitter works great and is tiny. I don't have to take the Ipod out of its case. The BT-3030 works flawlessly with it as well. This gizmo offers a good solution for both headset and music. Whereas most Bluetooth products are one or the other (in/on ear single-channel, or dedicated over-the-head or behind-the-neck stereo headsets) this gives the flexibility to do both. I wanted to do the majority of my listening with my own headphones, after all, I spent a lot of time and money choosing them! But I wanted only one bluetooth gizmo, so wanted to be able to have some lightweight solution for more mobile use. BT3030 fits these requirements, without much compromise at all. When I'm out and about, and want to leave the expensive cans safely at my desk, I switch to the included light-weight earbuds, which have a good cable length and configuration. Three sets of silicone tips let you choose a good fit. This more-discreet, more-portable configuration is a good in-car or walking solution. As for the form factor, I think it's great. I don't do the pure dog-tag thing with the included chain, rather I have a small 'biner on it which I use to hook it on my badge lanyard at work. When out, I use the included clip. Controls work just fine. Battery life is good enough for me; I'm not a super-mobile power-user, though. I've always got a mini-USB nearby to charge when needed (overnight or during lunch). The only other real competition I found was a Plantronics in-ear boom mic which offered an attachable second earbud for stereo. I found this too much of a compromise -- the boom mic wasn't that good, and neither was the stereo configuration. YMMV. Best Bluetooth earphones out there. performed as promised, maybe even just a tad better. good timbre. Balanced resonance without being tinny & twangy. Bass has solid tone and strength without being overdone. stereo streaming pretty much as promised. problem(s) with WinXP Desktop PC when streaming audio output. The Jabra BT-3030 is a sturdy and compact little device. It was reasonably easy to pair with my phone. I think the design is first rate. As for sound quality, I was not able to test the device with music (More on that below). It seemed okay with calls, but I honestly didn't use it for very long. I think that the headphones that come with the device are not the best, but the great thing about the design is that you can use any standard headphones. Now for the bad news. I bought the BT-3030 to use with my Apple iPhone. Before I ordered it, I checked with Jabra's own website to see if it was compatible. The website claimed that it was, but didn't offer any specifics. When I got the device, I found out that the BT-3030 is only partly compatible with Apple's iPhone. The BT-3030 pairs with the iPhone and it does work for making calls. Unfortunately, this pairing does not work for listening to music. That was such a huge disappointment that I ended up returning the BT-3030. What is the point of using this if it doesn't work for listening to music. After a little more research, I learned that the problem is that the iPhone does not support the protocol (called A2DP) for streaming music. "Boo" on you, Apple! It turns out that the only way to make this work is to plug a bluetooth dongle that does support A2DP into the iPhone. That seems really silly to plug a BT dongle into a device that already has BT. I purchased this to use at work. I work all day on a PC and like to listen to the music loaded on my BlackBerry. The cord from my ears to my BlackBerry was always getting in my way. I didn't want to be connected by wires to it (I have pulled it off the desk a few times) but I still wanted to be able to skip through my music. The Jabra BT 3030 was exactly what I needed. I wear it around my neck and use retractable ear buds to limit the cord mess. I love being able to pause, play, skip forward or back without having to touch my phone. It even works great to attach my work badge too. The music sounds great. And I have used it for phone calls too, with no complaints. I would recommend this to anyone looking for a great way to listen to their music without having to be attached to your music. This fills a need that is addessed by very few other products, a BlueTooth microphone that works simultaneously with both a music player and a phone over your choice of headphones, earbuds, etc. This is a boon for those of us with phones built into our sports helmets and custom made earbuds. That said, this works with the iPhone 3G only as a phone. I haven't been able to use it to play music from the iPhone. That is mostly fine with me since I have a bluetooth transmitter for my iPod and the BT-3030 works with it to play music and then with the phone when a call comes in. I've used this device for over a year now, mostly while running and loved it so much that I am ordering my second, after the first one broke. I use it with my Samsung Juke, and I mostly listen to lectures or podcasts - only sometimes music. 1) The earphones! I've used this on runs as long as three hours and the earphones remain comfortable, and provide surprisingly good noise isolation. I have used them on the subway and on airplanes and had no problems understanding what I was hearing. 2) I have had no problems with the volume, as a previous reviewer stated. In fact, it is louder than earphones plugged directly into my phone. 3) As most other reviewers have said, this works great out of the box. No problems setting it up, or pairing. 1) I'm not sure if this is a problem with the phone or with the dog tog, but when the phone is in my back pocket, I get no reception unless I also flip the dog tag to my back. This may also be because I am made of steel. 2) I suspect this is a problem with the phone, but when a phone call ends, I usually have to reboot the phone to continue playback through the headphones, even though the devices remain paired. 3) The clip on the dog tag does not work at all. I never got it to stay clipped on anything for more than a few minutes. It's really annoying, because the chain isn't really the ideal solution for running either, unless you enjoy something constantly banging you in the chest. The Jabra BT3030 works perfectly with the Blackberry Bold. 7. Controls allow you to go to next track, increase volume, initiate and answer phone calls, pause and play. Amazon delivery was next day even though I expected 2-day. Only downside, and it's small, is that it cannot be used while it is being charged. I have tried many bluetooth Earphones to use while jogging or driving in autos without dedicated bluetooth A2DP connection capability, and found all of them lacking is something. The Jabra BT-3030 is the best of the lot that I have looked at. Initially I had a little bit of fading in/out while jogging, but that now seems to be solved by keeping the unit well charged and proper positioning of the cell phone and the BT-3030. My primary use has been listening to audio books. The controls are easy to understand and fully functional. It is easy to pause the book when outside (traffic) noise gets too loud and restart after the trucks pass. The volume controls are easy to use to compensate for background noise level changes. The one time that I have received a phone call while listening to the books functioned flawlessly. The book was automatically paused, the call was easy to pick up, caller reported reasonable audio level, and the book automatically restarted when the call was terminated. The included headphones are adequate and the design is perfect for use in a single ear while driving or jogging in a congested area and easily adapts to two ears when you want to immerse yourself in the book.